Hi Julia, how are you today? Can you please present yourself to our readers? Where and when did your life as a creative being begin? 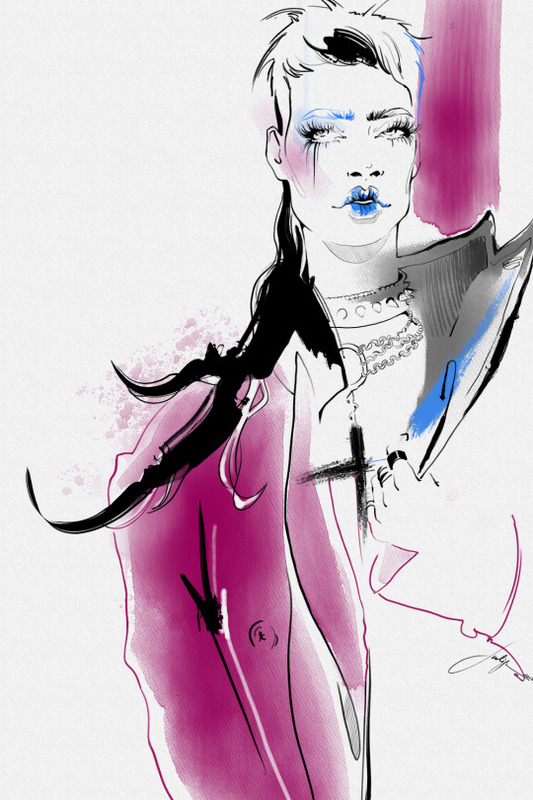 My name is Julija Lubgane and I am a fashion illustrator. My creative journey started back in Latvia when I was about seven years old. I always saw my dad creating, whether it was drawing, sculpting or wood crafting. He was the one who is responsible for embedding the craft of art in me. He would give me drawing lessons and increase the difficulty day by day. It was not until I found my mom’s sewing fashion magazine that increased my interest to become a fashion illustrator. All the designs in those magazines were illustrated by hand, and I was absolutely mesmerized by the beauty and accuracy of drawing skills. That was the pivot point when I realized that this is what I want to do, this is who I want to be. You’re now based in Chicago. Tell us more about your decision to move from Latvia to United States. I enrolled into the Art College when I was 15 years old and graduated with honors with Fashion Design degree. However, I was unable to find anything suitable in Latvia for my dreams and passion for illustration so I decided to move to United States. I barely spoke English and had no one in Chicago to lean on. But nothing was going to stop me to achieve my goal. I enrolled in The Illinois Institute of Art - Chicago, where I spent the next 5 years studying Fashion Design and Business of Fashion. This school truly exposed my skills to right people. The Director at the time was very supportive of my art and provided me with opportunities to display my work in school events and outside parties. This is exactly how I met my current employer. I have had the privilege of illustrating fashion apparel for Cintas Corporation since 2011. I absolutely love my job and am thankful for all the opportunities that I have had since being a part of the amazing Cintas design team. I have big ambitions and lots of ideas. 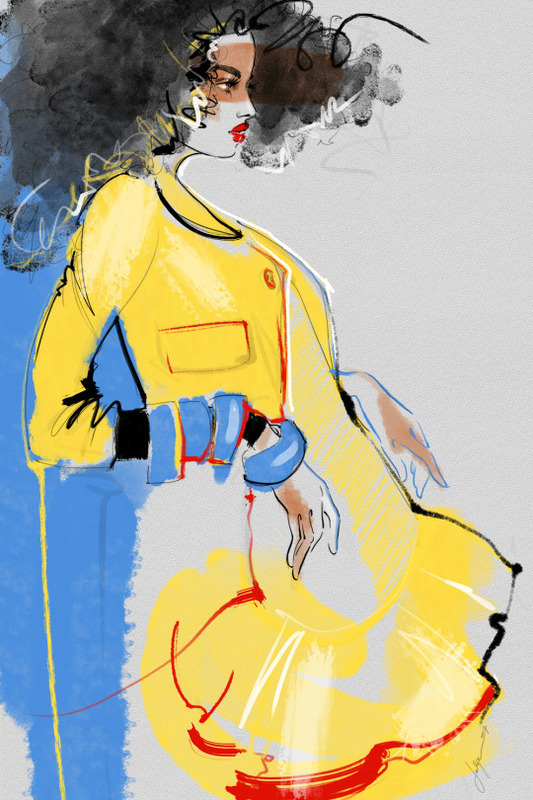 Because of that, outside my daily illustrator job, I illustrate my own fashion art. I have been doing that for almost 20 years now. I try to practice every chance I get because I believe that every artist should be a master of their own style. I go through good days when everything on paper looks just how I imagined, and I also have those days when nothing goes right. I try really hard to balance it all – my family, my art and my personal life in order to have an inner happiness and steadiness. Besides formal education, what is the hardest thing you have had to learn as an artist? The hardest thing that I had to learn is who I am as an artist and then work extremely hard to polish my unique artistic style. As an artist, I am my harshest critic. I perfect each piece until I feel it is worth exposing to the public. I practice a lot and strive for perfection in lines, shading and color application. I am very sensitive to balance on the page – it must be perfect! Every line and every shape has its own place - that is how you make a piece look effortless. Sometimes it takes many tries to perfect the balance of a drawing on the page, but when it’s right, the satisfaction is enormous. I also like to try new techniques with my art - as long as I can stay true to my style and don’t disconnect too far from my drawing aesthetics. 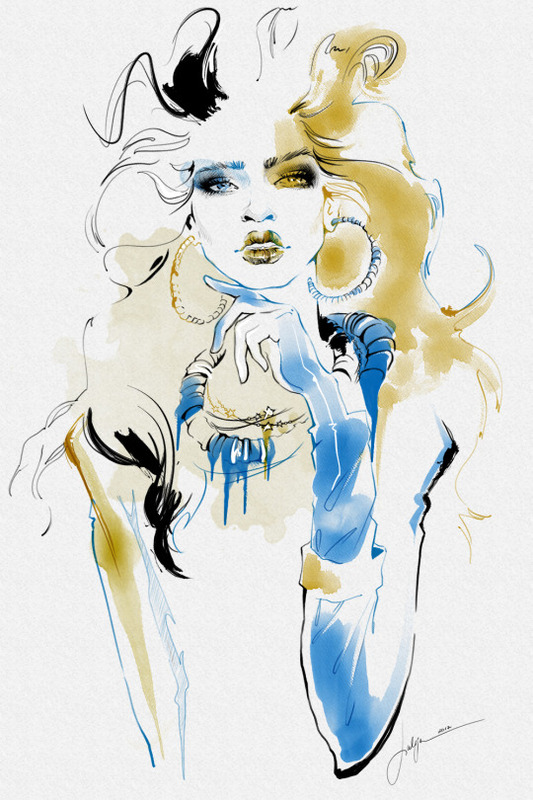 Your fashion illustration leaves us speechless. 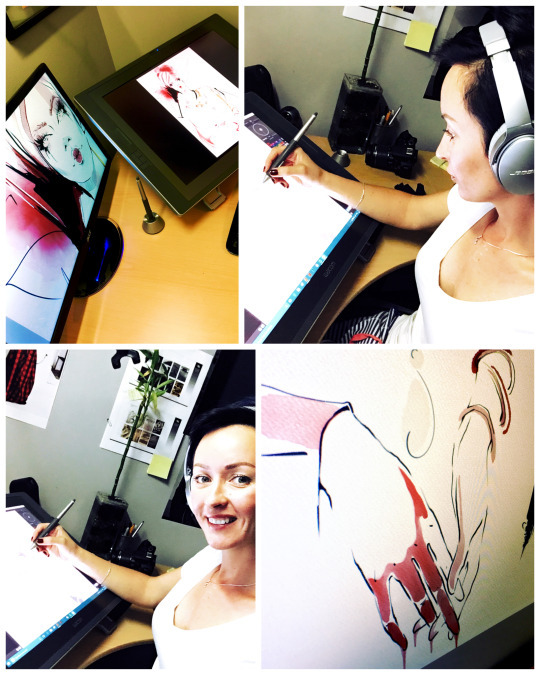 It looks like your art and Rebelle were made for each other. 😊 How did you come across Rebelle and what are your thoughts on it? 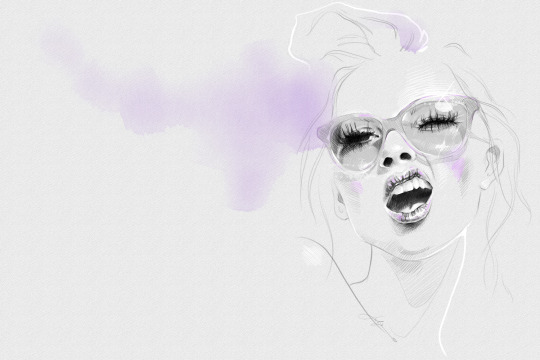 Illustration: are you a natural talent or are your skills laboriously acquired? I do believe, because of my dad and his skills, I have what you call “talent”. However, nothing in this life comes easy, including art. I do believe that you have to work hard and work a lot in order to achieve your goals and dreams. Like my dad always said: “Art is 10% talent and 90% work”. Are you morning bird or night owl? What time of day does your creative mind work at full throttle? Oh, I am definitely a morning bird! I love mornings! I love my coffee in the morning and uninterrupted drawing time. I can wake up as early as 4 or 5 o’clock in the morning if I have the need to draw. I enjoy seeing the sun through the big windows in my office that oversee my beautiful back yard. I was never a night person - even in college! I never stayed up late to finish anything - everything was completed on time and during the day. I always joke that my brain shuts down past 6 p.m.
Where can people see and buy your artworks? I am very active on Instagram @julijalubgane. I post new art, my work in progress and live videos almost daily. Also, I have my website www.julijalubgane.com. Two other places that I love to post are Behance and Coroflot. I think these two sites are amazing for any person who creates. Also, I sell my prints on Etsy and Amazon. 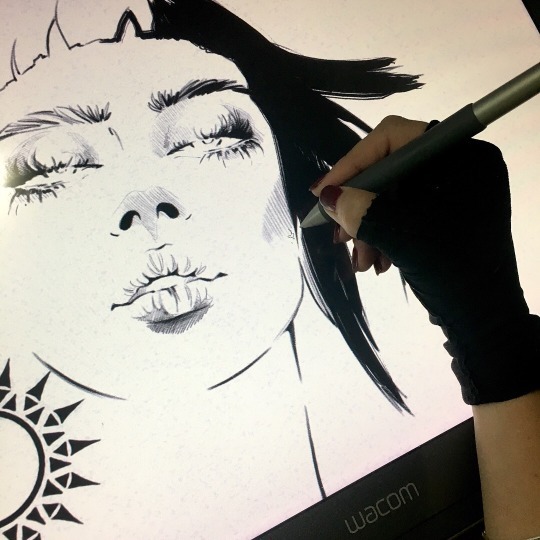 People can see my art all over the web - simply type in my name and the search results will take you to many different sites. Thanks for all Julija and keep up the good work!